Bottom line: If the pivot table field list went missing on you, this article and video will explain a few ways to make it visible again. 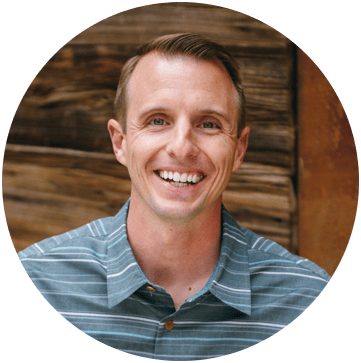 I also share a few other tips for working with the field list. Typically when you select a cell inside a pivot table, the pivot table field list automatically appears on the right side of the Excel application window in a task pane. However, the pivot table field list can go missing (get disabled) if you accidentally press the close button in the top right corner of the field list. The close button hides the field list. This means that it will NOT reappear when you select a cell inside a pivot table. So how do we make it visible again? Here are a few quick ways to do it. Probably the fastest way to get it back is to use the right-click menu. Right-click any cell in the pivot table and select Show Field List from the menu. This will make the field list visible again and restore it's normal behavior. The field list will disappear when a cell outside the pivot table is selected, and it will reappear again when a cell inside the pivot table is selected. The Field List Button is a toggle button. This means we only have to turn it on/off once to keep the setting. When we click the close button in the top-right corner of the field list, the toggle will be turned off. The field list will be hidden until we toggle it back on. The field list can also be toggled on/off from the ribbon menu. First select any cell inside the pivot table. Click on the Analyze/Options tab in the ribbon. The tab is called Options in Excel 2010 and earlier. Click the Field List button on the right side of the ribbon. This is also a toggle button that will show or hide the field list. The most common reason the field list close button gets clicked is because the field list is in the way. Sometimes it covers up the pivot table and forces you to scroll horizontally. We can actually move the field list outside of the Excel application window. You can even move it to another screen if you have multiple monitors. When you hover the mouse over the top of the field list, the cursor will turn to cross arrows. Left-click and hold to drag and move the field list. To re-dock the field list, double-click the top of the field list window. That will automatically move it back to its default location on the right side of the Excel application window. The field list always disappears when you click a cell outside the pivot table. I have always thought it would be nice to be able to see the field list while working with the source data sheet for the pivot table. So I built this feature into the PivotPal add-in. 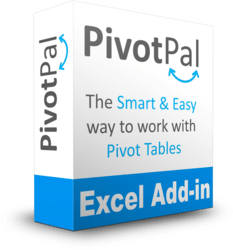 In the video above I explain how you can use PivotPal to build and modify the pivot table while looking at the source data sheet. This feature saves me a ton of time every day. I don't have to jump back and forth between the source data and pivot table sheets. This is especially useful when searching for a field that I don't know the name of. 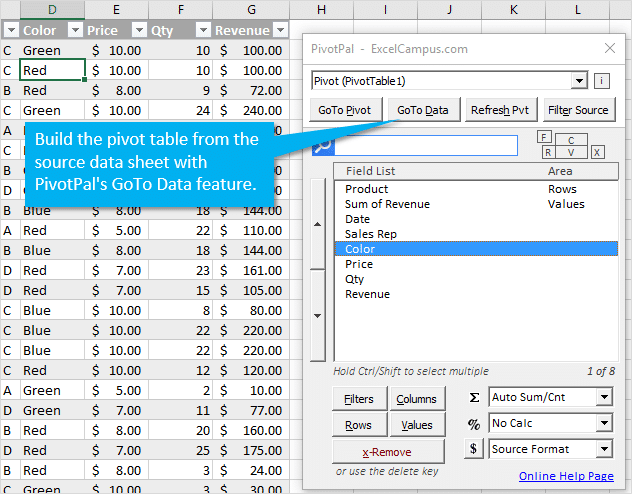 PivotPal is an Excel Add-in that is packed with features. It will save you a lot of time when working with pivot tables. What Are Your Favorite Field List Tips? 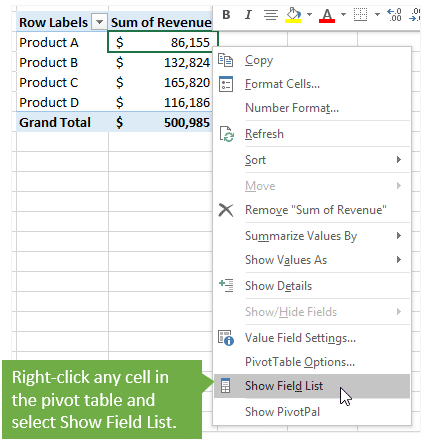 Do you have any other tips for working with the pivot table field list? Please share by leaving a comment below. Thanks! Thanks so much Jon!! Solved my issue. Thanks David. What a huge help to me today! It saved me so much time and frustration. My excel Pivot table is disabled/inactive when reopen the file. Solved my problem, thank you!!! My Pivot table field doesn’t show the search tap. MANY THANKS, HELPED A LOOOOOT! The real solution is to shut down Excel, navigate to the username\AppData\Roaming\Microsoft\Excel folder, and delete the excel15.xlb files from both that folder and the XLSTARTUP folder. Launch Excel and your field list will reappear in its old position, docked on the right-hand side of the window. I was helping a colleague with a similar problem and saw Steel Monkey’s solution posted here. My colleague’s field list was being displayed as an undocked window, and it was positioned partially off the top of his screen so he couldn’t reposition it. We found an “excel14.xlb” file as suggested by Steel Monkey. Deleting that caused the field list to be docked again. (We didn’t see an “excel15.xlb” on his system.) Thanks for sharing the solution! Excellent help. I was in locked environment for pass 20 years. just restart my new job playing with pivot table. this tip really helpful. thanks ! Thanks so much…this solved the problem! Hi! Thank you for your tutorial. May I ask what version of excel is being used in it? Thank you in advance. I don’t have any option to show PivotTable Chart. How can i get it? I have Excel 15.30 for Mac and I hate that the Field List for Pivot is floating and not docked as I was used in Windows. Do you know how to dock it? I had the same issue and I resolved it by double clicking on the name “PivotTable Fields”. my field list has moved off the screen, i can see the bottom part but because the top is not in sight i cant move it. any tips? That sounds like a tricky one. You might want to try changing the monitor resolution to see if that helps move it into view. I don’t believe there is a keyboard shortcut to dock it. I looked at all your advice, and still can’t bring it up. This is a spreadsheet that somebody else created, and has taken great pains to lock down. When I choose “Show Field List”, nothing happens. When I click on the pivot table, I do not see the “Analyze/Options” menu appear. Any idea where I go next? The creator of that file probably used VBA and/or modified the XML code of the file to hide the Ribbon menus. VBA was the first thing I thought of, but when I set up my Excel properties to not run VBA code, I got the same results. I even deleted all VBA code and opened the worksheet again, with no luck. Where would I view XML code and see if this was set? I did discover that a few worksheet tabs DO have editable Pivot tables, but most don’t, so whatever is causing this seems to be likely to be set at the worksheet level. But I could not find any property that seemed to be causing it. The XML code is not accessible from the Excel interface. You can access it by changing the file extension to “.zip” and opening the zip folder to see the files contents. There are also free tools like the Custom UI Editor that make it easier to view the XML code for a file. This is a topic I cover in detail in my VBA Pro Course. Here is a link to a free training series on Macros & VBA that is part of the course. I hope that helps get you started. As always thanks for taking the time to provide so much valuable information.